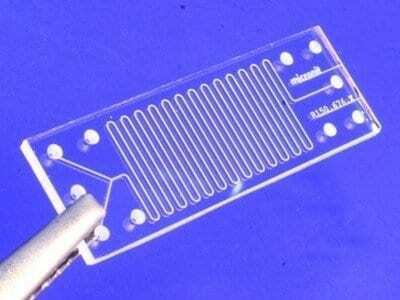 On a rectangular chip slightly smaller than a person’s finger, two scientists and an engineer are writing what they hope will be the blueprint for the future of drug testing. The researchers are studying the behaviors of cells to learn more about how cells send signals to each other. How are cells affected by the flow of blood? And how can they be studied outside the body? The problem that the group hopes to solve is a challenge that confronts many cancer patients: How can drugs be made to kill cancerous cells without harming healthy cells and tissue nearby? The researchers represent three disciplines. Yaling Liu, assistant professor of mechanical engineering and mechanics, studies the interfacial phenomena that occur at the micro- and nanoscale of biological systems. Linda Lowe-Krentz, professor of biological sciences, is a cell biologist who studies blood vessels and the changes that cells undergo in response to blood flow. And Daniel Ou-Yang, professor of physics, has developed novel methods of using microscopy and lasers, including “optical tweezers,” to study the activities of cells at the nanoscale. The researchers and their students are developing a method of testing cancer drugs on a chip etched with channels that mimic the branching capillaries of the human lung and are coated with human endothelial, or blood vessel, cells. In addition to learning how to target drugs selectively at cancerous cells, they hope to reduce the cost of drug tests as well as the time it takes to run them. The project has been supported for more than a year through Lehigh’s Biosystems Dynamics Summer Institute, which is funded by the Howard Hughes Medical Institute. The group recently received a three-year grant from the National Institutes of Health. Current cancer treatments, says Liu, can be extremely invasive. Most chemotherapies, for example, disperse an anti-cancer drug into the bloodstream, where it destroys both cancerous and noncancerous tissue and cells. Standard drug-testing methods also have shortcomings, says Lowe-Krentz. Some tests are done in the static environment of cells and cultures, which don’t mimic the behavior of the entire organism. Others are performed on animals: this is expensive and the results can be unreliable because a drug’s effect on an animal is different from its effect on a human. By conducting tests on a chip, says Liu, researchers can approximate the environment a drug encounters inside the human body and track its fate in that environment. Chips are cheap—each costs less than a dollar to make, and multiple tests can be run simultaneously on a series of chips. Size is another advantage. In a test, the small chip uses only about a tenth of the amount of drug and tissue required by more conventional testing methods.